If the League of Nations was dedicated towards the organisation of peace, then how can we explain its preoccupation with knowledge? One glance at the expertise and reports the Secretariat and various Committees generated during the League’s lifetime demonstrates the importance attached to institutional processes of knowledge production. To illustrate the role of knowledge, let us recall a curious meeting that occurred in September 1920, between Secretary-General Sir Eric Drummond and Paul Otlet, a Belgian lawyer and peace activist. 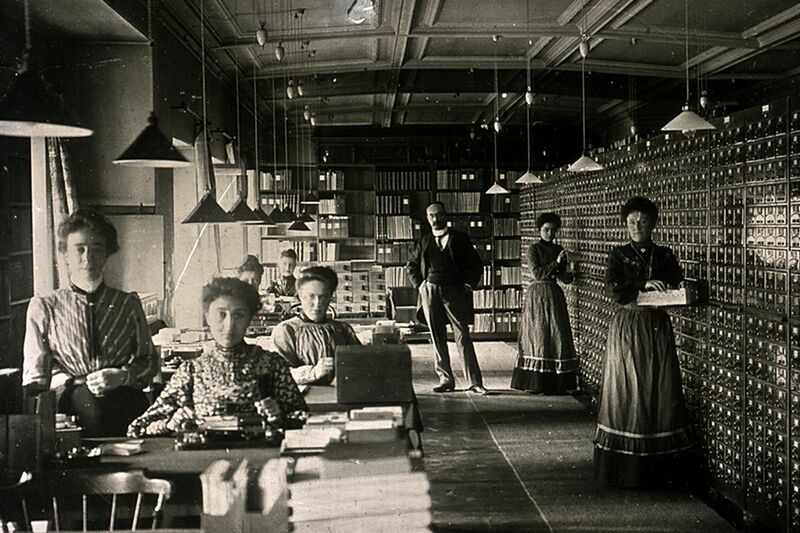 Otlet had founded the ‘Mundaneum’, an institution to gather all the world’s information in one place. Why was Drummond keen to meet Otlet and learn more about his peculiar institution? The ‘Mundaneum’ and its universal system of classification may have served as an inspiration for the League of Nation’s approach to knowledge. Otlet claimed that knowledge was a ‘great social force’ that had to be mobilised for the benefit of humanity. To remind you, the League came into existence as an experiment in the organisation of peace that sought to find more rational means for the conduct of international relations. In other words, if conflict could be eradicated with the help of reliable data, objective information, impartial experts and better-informed decision-making, the role of knowledge would be vital for the future of international politics. The League never adopted Otlet’s project of a universal repository for information, although his thinking about knowledge and its role in the pursuit of peace shine through in the League's intellectual work. Knowledge is essential in the institution’s functioning: statistics and data collected by the League, as well as reports written by experts, were meant to inform Council and Assembly discussions and the decision-making process. The history of the League and its myriad forms of knowledge production, however, is one that has not been the subject of academic scrutiny. Whereas the United Nations’ management of knowledge in the 21st century has been studied in some detail, its predecessor lacks a similar exposition. International Relations (IR) scholars have looked at the role of knowledge in international organisations, however, this scholarship presents neither a unified theory nor a methodological toolset regarding knowledge production. Despite the theoretical and methodological challenges, we can learn from the approaches and questions used by IR scholars. Broadly speaking, they seek to find out how international organisations employ knowledge to attain prescribed aims, such as conflict-resolution or development goals. To this end, IR scholars look at organisations’ discourses and their written documentation. How to approach the League of Nations from the perspective of knowledge production? For reasons of brevity, I will focus on one aspect of the League’s quest for reliable information: inquiry commissions. Using several examples, I will explain characteristics of these League commissions as well as the challenges and complexities they had to overcome. Although these knowledge-producing bodies submitted themselves to compromise in their search for answers, inquiries created a set of institutional practices which are still in vogue at the international level today. The League relied on inquiries to gather ‘the facts’ about issues with repercussions for the international community. The League was the first of its kind to rely extensively on a semi-judicial tool for the resolution of international issues. It sent out inquiries to disputes in Manchuria (China) and the Chaco (Bolivia-Paraguay) to assemble a reliable account of what had occurred. In other instances, it investigated issues that had provoked public outrage and required international action, such as the trafficking of women and children. Inquiry commissions take a slightly odd position within the League’s international bureaucracy, because they were created on an ad-hoc basis and solely composed of commissioners with no permanent ties to the League. Thus, they are distinct from the Secretariat and any other permanent League bodies. Despite this, inquiries are a useful case study because they appear across the board in the League’s institutional history. Inquiries are an exhaustive subject; therefore, I will focus on three areas that I deem of relevance to understand the League’s approach to knowledge production. First, the types of knowledge that were gathered, produced and disseminated by the inquiry commissions. Second, the conception of expert knowledge conceived by the relevant actors. For instance, in the hiring practices for experts in preparation of the inquiry. Third, the purposes that were assigned to the production of knowledge as part of inquiries. The three areas should help to obtain an overall image of inquiries, their potential success as ‘truth-seeking’ tools and how they laid the grounds for international investigations today. In preparation for an inquiry, commissioners needed knowledge about the subject matter and the places they intended to visit as part of the investigation at their disposal. The League’s Secretariat gathered memoranda, maps and pamphlets from individuals they deemed experts, and academic societies and national ministries. Although providing knowledge for the inquiries, these sources could also frame the subject matter and introduce bias. For example, in the League’s dealing with the non-Western world, it often relied on imperial administrations to fetch reliable statistics and surveys. In the case of an investigation into opium production in Persia, the information gathered via representatives of the British Empire was difficult to separate from the British economic interests in the country. Most investigations followed the pattern of a three to four months stay on the ground, with visits and talks to officials as well as the collection of data and testimonials. The collected information provided the foundation for a final report - which often was a composite document reflecting the views of several commissioners. Consensus had to be found amongst Commissioners, although often after a series of disagreements. The practices behind the investigation on the ground and the writing of the report strongly differed because the mandate given by the League. Various issues were investigated. Political disputes presented inquiries with the additional risk of political intervention. For instance, the League Council could be tempted to put the objective of peaceful resolution before an investigation of the facts. 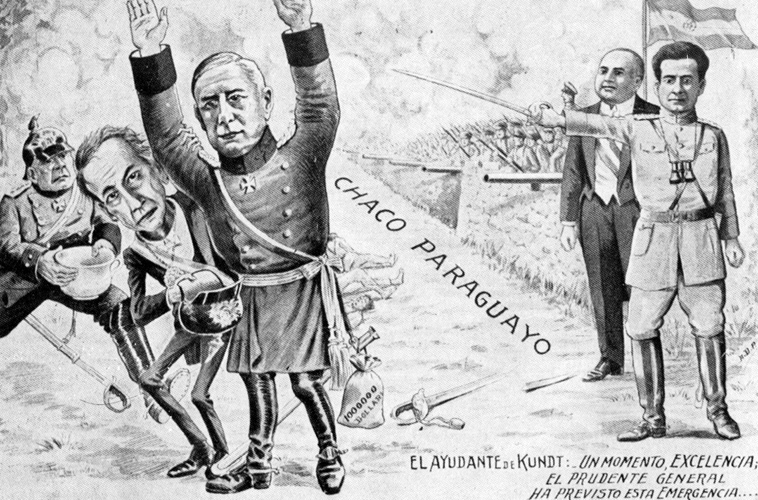 With the Chaco War, a territorial dispute between Bolivia and Paraguay in the 1930s, the Council insisted upon a dual mandate: to study all aspects of the conflict and do ‘whatever it takes’ to end the conflict. Fairly quickly, the Chaco Commission saw the limits to this approach, since the facts of the conflict, particularly the question of who had provoked the hostilities, precluded a sustainable reconciliation. In its final report, it abandoned its inquiry into the causes of the Chaco War, favouring the description of a possible peace agreement. The hiring practices reveals how there was no one-size-fits-all approach to finding experts to serve on inquiry commissions. The composition of inquiries into political disputes primarily around the nationality of the individual commissioners – rather than professional background – with large member states eager to have a representative on the team. Other inquiries allowed for more leeway, by mediation of the Secretariat, to approach individuals for their subject-related expertise or exposure to the situation on the ground. However, in no case were women seriously considered to serve on a commission – regardless of their expertise. The Persian case exemplifies how ‘expert knowledge’ was the subject of compromise, depending on availability of people, their knowledge of the region in question, or general professional background. Work experience in the colonies was often perceived as a strength, in dealing with the non-Western world. The inquiry into forced labour in Liberia in 1930 had a British doctor as chairman, who had extensively worked on sleeping sickness in colonial central Africa. Although the chairman had never set foot in Liberia before and had no relevant subject expertise, his familiarity with environmental conditions was seen as more important than his grasp of the complexities of the issue. Inquiry, what is it good for? Inquiries were talked about in terms of high ideals, i.e. impartial investigations to find out the truth. As Salvador de Madariaga expressed at a Council session in 1931, inquiries were ‘the surest guarantee we have today that difficulties will be settled in the fairest manner and in the interest of peace. A Commission provides guarantees of knowledge and impartiality.’ Although the League could rely on local observers or press reports for information, the possession of its proper fact-checking tool was deemed as a vital help for decision-making in the Council and Assembly. In 1932, Council President Aristide Briand stressed ‘the importance to the League of obtaining information by its own methods, by methods for whose accuracy it can vouch’ especially in cases where facts were disputed by opposing parties. In practice, the ideal of an inquiry was fraught with tension and impossible expectations. Diplomacy counteracted fact-finding: for example, a Japanese representative’s referral to truth as ‘a condition for the League’s life and growth’ did not stop him defending his country’s actions in Manchuria based on security reasons. Truth-seeking was hampered by power politics: quests for leadership within the commission but also countries competing over economic interests in the international arena. Notwithstanding these practical setbacks, knowledge could act as a catalyst and set about political change. For example, the League’s inquiry into forced labour led to a series of political resignations in Liberia. Overall, inquiries stimulated talk at the international level about atrocities and violations of international law. Questions of success and legacy of the League’s inquiry commission are difficult to gauge, ad-hoc decisions and compromise underlie many of the examples cited above. However, there is recurring evidence of a belief in the rational and technocratic means that was to underscore international politics. The League built a set of institutional practices for international investigation that, at least in theory, allowed for dispassionate fact-finding and issues being disentangled of from their politicised context. For this reason, I would argue that it’s valuable to look beyond the individual examples, to the framework of international inquiry that was set in place and still underpins the UN’s fact-finding missions today. Knowledge production at the international level has pushed diplomacy’s covert channels towards greater public scrutiny and made discussion over matters of war and peace accessible to all. W. Boyd Rayward, The Universe of Information, (Moscow: VINITI for the International Federation for Documentation, 1975), 229. N. Svenson, The United Nations as a Knowledge System (London: Routledge, 2016). A good starting point for IR scholarship on knowledge production: Guevara, Berit Bliesemann de, and Roland Kostic. “Knowledge Production In/about Conflict and Intervention: Finding ‘facts’, Telling ‘truth.’” Journal of Intervention and Statebuilding 11, no. 1 (January 2, 2017): 1–20. https://doi.org/10.1080/17502977.2017.1287635. The general exceptions to this rule were the opium and women trafficking inquiries that were supported by the Secretariat's Social Section and as a result could rely on a semi-permanent structure and support in the investigations. LN Official Journal February 1934 – Council Meeting held on January 20th, 1934 – Dispute between Bolivia and Paraguay – Report of the Committee of Three. LONA, R801, 12A-45255-46962: Services of an agricultural expert, appointment of Professor Cavara, letter from the International Institute for Agriculture, 3rd December 1925. LONA, R801, 12A-45255-50014: Services of Mr. Jewell B. Knight, letter from Knight to Purves, 19th May 1927. LONA, R1865, Discussion at the 65th Session of the League of Nations Council September-December 1931. 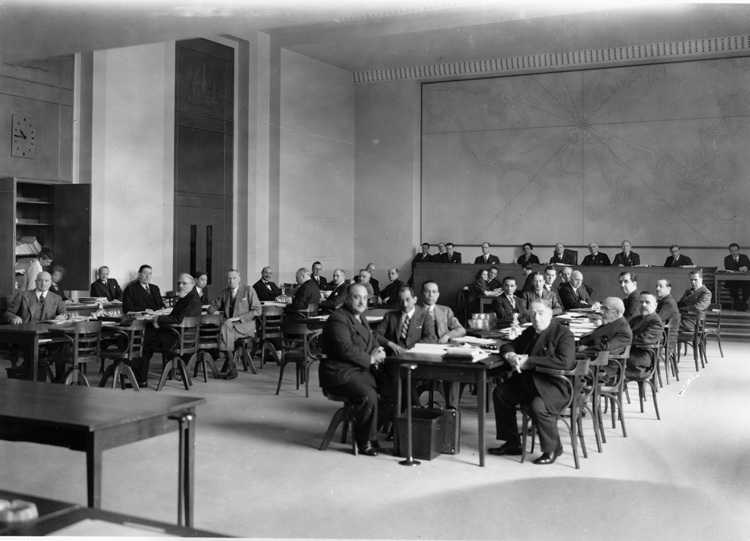 LONA, R1870, Discussion at the 66th Session of the League of Nations Council January-February 1932.